How to buy all season tyres and why? All season tyres have been around for a very long time. Many commercial vehicles use all season tyres mainly because they are thought to be able to withstand heat, cold and wet conditions. All season tyres appeal to people who don’t want to go through the hassle of changing their tyres twice a year. 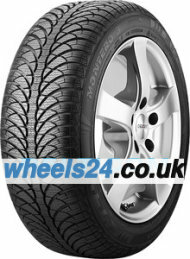 However, unknown to most vehicle owners all season or all weather tyres make compromises. Technically, there can be no tyre that can do a 100% good job in both summer and winter conditions. So, all-weather tyres do a little of both. What makes all season tyres good for all seasons? As mentioned above all season tyres make compromises. So, before you buy a tyre you need to know what compromises it makes and if you’re comfortable with it. The compromises may or may not be suitable depending on where you live. Technically speaking all season tyres available in the UK by leading brands such as Goodyear, Hankook, Dunlop etc. can be defined as being winter tyres that are wet optimized. Because the tyres are siped like most winter tyres available but use slightly different compounds to withstand the excess summer heat it improves wear during the dry weather. Plus, a few tyres from Nordaic companies are referred to as summer tyres in the UK but are referred to all season tyres in Nordic countries. What factors should you examine before buying all season tyres? Start by considering how the summers are like in your part of the country. How much does it rain and what the mean temperature is throughout the year? If the temperature does not plummet below zero and does not go above 35 degrees centigrade, then all season tyres make sense. But if it snows in winter, then all-season tyres cannot be used all year round. You will have to at least switch between all season tyres which you use for the most part of the year and winter tyres right around the time it starts snowing. Which companies sell the best all season tyres? We currently sell a vast selection of all season tyres from leading brands as well as lesser-known brands in the UK. However, even though we suggest that you always buy from a well-known brand people on a budget can buy a high-quality set of tyres by a lesser known brand. So, it all depends on what you can afford and how much you drive. If you’re going to be using the all season tyre all year round then it would be a good idea to buy from a well-known brand. That said if you’re going to switch to winter tyres every six to eight months then a cheaper brand will ensure that you save some money for good winter tyres If you need help with choosing all season tyres then do not hesitate to get in touch with us via phone or email.